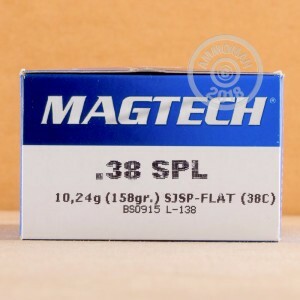 This is great 38 special ammunition for shooters looking for a soft point bullet for defense. Loaded with a 158 grain semi-jacketed soft point bullet with a flat nose, these rounds are designed for flawless performance, maximum energy transfer and penetration into a soft target. In terms of ballistics, you’ll get about 744 feet per second worth of muzzle velocity and 200 foot pounds of muzzle energy. Other components include a boxer primer and brand new, never fired brass case. 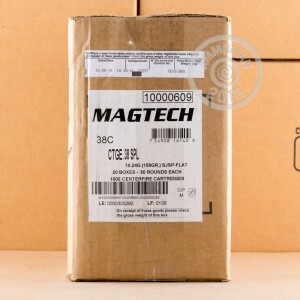 Magtech is a Brazilian-based company that has been producing high quality ammunition and components for the world market for years. These centerfire rounds will be delivered in a single box, containing 50 rounds of brand new 38 special ammunition, perfect to toss in your range bag or load into your magazine and introduce to your firearm. Great ammo for LW revolvers. Found this a great round for my S&W M-12 revolver. If you have a alloy, light weight, an older revolver not rated for +P or are recoil sensitive this is the ammo for you. Fixed sighted guns are regulated for 158 gr. bullets and this stuff shoots point of aim for me. 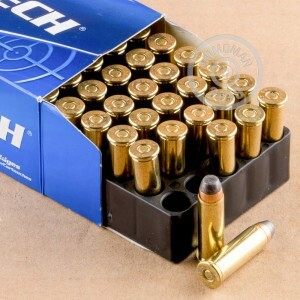 This turned out to be good ammo,I have had no problems with the 2 boxes I purchased.I plan On getting more of this Ammo soon,Ammoman is the best place 2 go for ammo on the Web for me,Super fast shipping,Everything ships within 24 hours.....Thanks again !